Abu Dhabi: Delivery boys perhaps have the riskiest jobs in town. Every time they hit the road, their lives are on stake as speeding vehicles pose a constant threat to them. Under tremendous pressure to deliver on time, these boys stand to incur the wrath of both their managements and customers sitting in their air-conditioned apartments or offices, should there be even a few minutes delay. He said, “I am the only breadwinner in the family and my parents, wife and two children aged, six and 12 years, are dependent on me. So I have to be very careful,” he added. According to the delivery boys, one common complaint from customers is that they do not pick up their follow up calls. Another delivery boy who did not want to be named said restaurant delivery boys usually start their day at 11am and work till 4pm for lunch orders and from 7pm to 11pm to cater to dinner orders. The boys said that some streets are more risky than others. “On Salam Street, the speed limit is 120kmh but our motorbikes can’t keep up with that. We have to make our way in between speeding cars and it can get scary and life-threatening at times,” said Sarwar. Needless to say, the weather can also add to the challenge during summer. “It’s tough when the mercury rises to 48 degrees Celsius. So we wait for the winter months which are relatively easier on us,” said one delivery boy. Restaurant owners said their priority is timely delivery while ensuring their staff are safe. 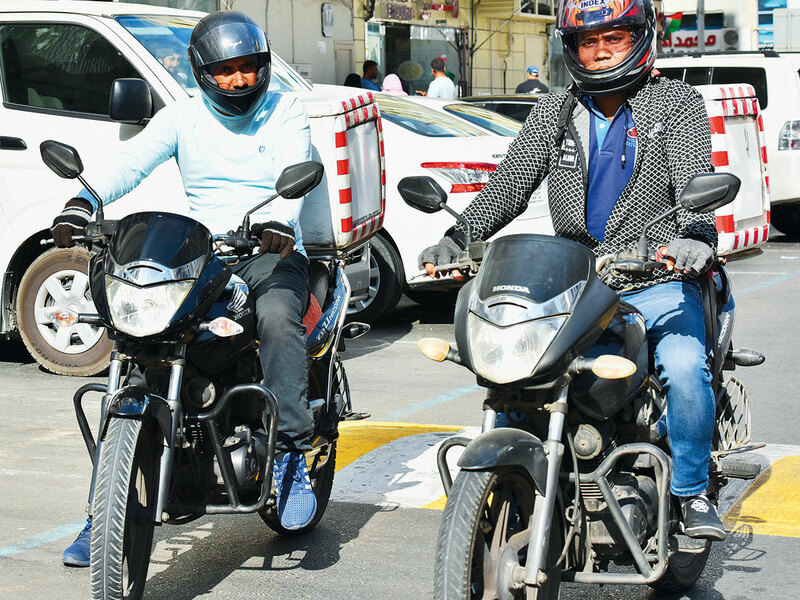 The delivery boys said some drivers who ignore traffic rules and stop anywhere pose problems for them. “Some new taxi drivers, for example, take a turn or change lanes without flashing their indicators, which endangers our lives on the road. It happens when customers signal to make them stop closer to where they are,” said Sarwar. “Many times, motorists scare us with their loud car horns while they overtake us,” added his colleague.